I mentioned that this piano is getting a makeover! Yay! I can hardly wait to start this project! PS – I’ve already taken down the guitars. I didn’t like them either! 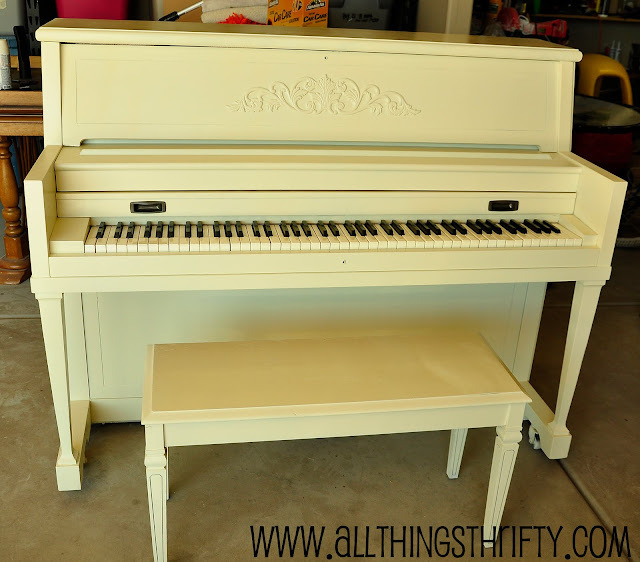 I’ve been collecting links for refinished pianos so I can decide how I want to do mine. Here are a few refinished pianos I’ve seen lately. Blue Cricket Design painted hers RED. 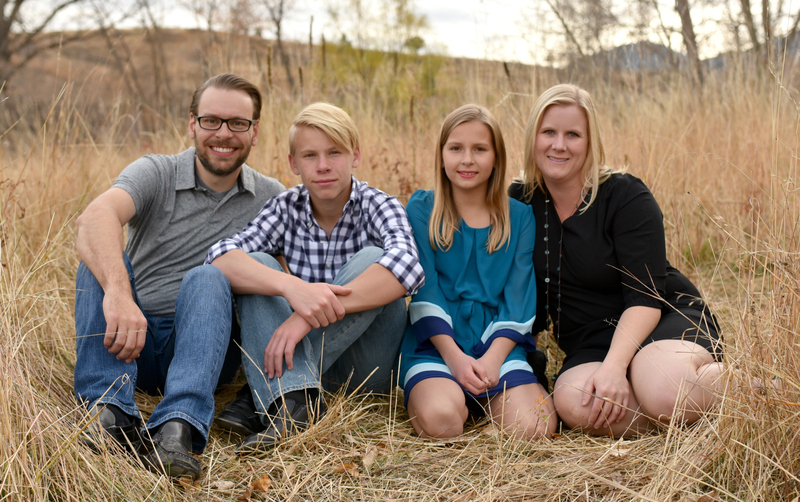 My Life… Unplugged. 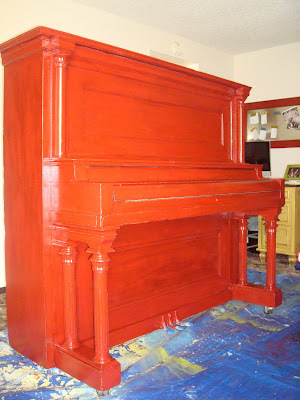 also painted her piano RED. Crap I’ve Made painted hers TEAL. Pugmire Studio painted theirs bright blue. Craft With Me painted hers pale blue. Design Mom chose a bright green for hers. All Things Thrifty then took it a step further and glazed it. And We Sailed On painted theirs a more rustic look. Mom2jope painted hers shiny BLACK. A Dash of Parsley gave her piano a black shabby chic look. Jordan Colburn sanded his down and stained to show the natural wood grain. 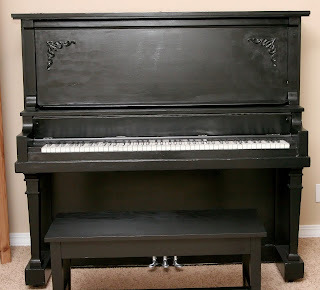 The Modern Hive painted her piano with chalkboard paint. Here’s one painted like a fireplace! How do YOU think I should paint my piano?? I’ll let you know how I *think* I’m going to do mine once I hear all your ideas! Also, these are just some ideas of how I could paint my piano. I’m open to all ideas! 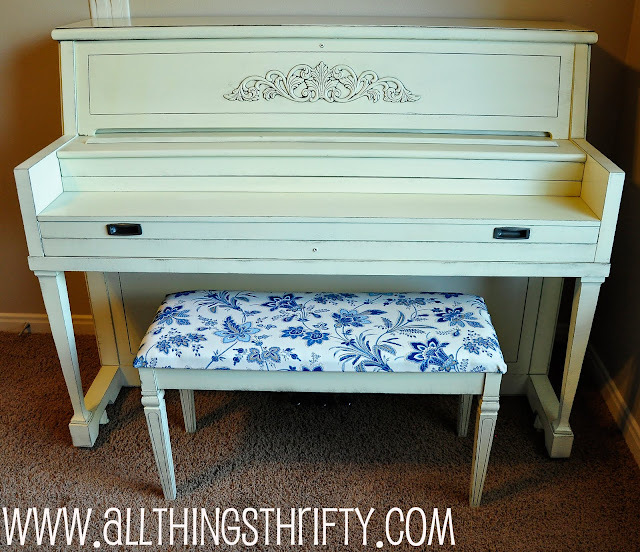 If you’ve blogged about painting your piano, add a link in my comments section! I’d love to see it. « Hanging Sheetrock is loads of fun! I want to paint our piano, too. I’m a sucker for white. It won’t be for a while, but that’s my plan. It badly needs a tuning, too, lol. Cool post! Thanks for including my piano. I really liked some of the bright vibrant colors. Very distinct, but it might be hard to get a really even finish. I like the more sedate versions, since a piano is a really big piece of furniture. The teal is really pretty. The fireplace one cracked me up though – some people’s creativity/cahones! Ok, that fireplace piano is CRAZY. I’d paint it black. I like all the brights but I’m just not all that brave! I loved all things thrify glazed piano and that fireplace was just plain crazy…but I have caramel walls and white trim like you and my piano is black and that is the anchor color I started with in my home and built the other colors around. It works great if you like black, easy to accessorize with. Personally, I like the rustic look of And We Sailed On. I grew up with a piano that was once teal with black glaze, and then stained dark red, and though it was fun both times, it dictated the room. I think painted like All Things Thrifty painted and glazed hers. That is beautiful!! I totally love the lighter blue one with the upholstered bench. Then the first red one. I can’t wait to see what you do! Play Me I’m Yours stopped me in my tracks! What an awesome way to draw the kids to practice- make it look like a toy! You could always modpodge it with scrapbook papers! But to tell you the truth, I like a more natural look to pianos, but you gotta do what you like. My vote is for the chalkboard paint. It’s so cute! I love the lines and overall shape of your piano – very classic. I would stay within that ballpark and either stain it a rich, deep espresso, or paint it a classic black. I think it would look like a million bucks! I really LOVE the rustic looking one from “As We Sailed On.” (I’m actually heading over there to see how they did that!) Either that or a high gloss black. I will admit I also reeeeeally like the chalk-board paint one, but only if it’s kept nice and clean like the photo, which just a smidge of a chalk drawing. Good luck! Can’t wait to see what you decide! I love the shabby distressed or antiqued painted look. I had a piano just like that and I had no idea how to paint it and it didn’t fit in out living room (literally) so I gave it to a friend. I am very interest in seeing how you do your! Hello Allison! I have a feeling this project is going to be great! I love the distressed and glazed look! Your piano also has two really great rectangular panel details. What about attaching a thin piece of styrofoam board wrapped in fabric in the top one to make a memo/picture board? and coordinating the fabric to a newly refurbished bench seat? or paint a neat stencil inside the rectangle? or add some ogee trim? I think the color has to depend on what the rest of the room looks like! Have fun brainstorming! Me personally, I like the high gloss black lacquer look for a piano. That’s just me. 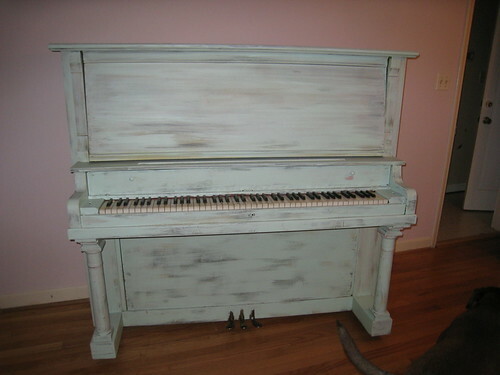 I like the All Things Thrifty Piano that is antiqued and glazed. I think you should glue a decorative wood carved piece on the front and then paint over it to dress it up a little bit. I don’t think that style is one you would get tired of anytime soon and it would fit into any room! If you want to have a little fun, paint the piano bench a bright color and then switch it out when you are ready for a new look. I really didn’t think I’d have an opinion – although I played piano, I’ve never owned one. However, looking at the pianos that were painted made me feel a little sad. In my circles, pianos have always been one of those things that were considered very special to have. I agree that it would be nice to refinish it – but the age and the history seems to call out for more than painting it red, or with chalkboard paint, etc. If I were you, I would go with something classic to honor the heritage of your beautiful piano. Well I know I HATE dusting away that natural protective coating that coats my dark furniture, so that wouldn’t be an option for me. Love that bright blue one & all the other blues. I think a pretty glazed creamy color would be nice & make the inset part like a fabric covered memo board with ribbons. OR if you like to dust then I was thinking of a black & white harlequin design would look interesting. I’m partial to the bright blue. I’m completely chicken to paint a wall a bright color, so my furniture gets the treatment, when I can. The fireplace one is awesome though. Creative people blow me away. Can’t wait for the “after” pictures! My fave is the teal… Love it! Love. It. I also like the black shabby/sanded look. That fireplace one is HI-larious! I think it looks great as is, but if it has to change, I’d go with the classic glossy black or possibly the cream if you’re going for a less-formal look. I would vote to sand it down and re-stain it. The wood that its made out of is so important to the sound, and should be showcased. However, I get that its a major project. If you do go with paint, I’m loving the cream/antiqued one! Thanks for including my piano! I love when I am not the only one staring at it!! Ok why didn’t I see the chalkboard one when I was doing it?? That is cool, but man that would break the bank! So I like almost all of them, but you saw my piano and I saw the red piano before I painted mine and my husband told me NO even though it’s awesome! I am a plain jane in most parts. I totally would have done the blue, but he said think of the resale value and my choice went to black or brown after that. Oh and when I did primer my piano looked bad white ;). My cousin made the fireplace one!! Awesome that you found it, because I was going to suggest it! I just found your blog, and I’m LOVING it! 😀 I think you should paint the piano your basic black. I just think it would suit the style of the piano best. Good luck. My vote is for either the teal or the black, I think both of those are stunning… I’m not so sure about red… I think you’d get tired of it quickly (I know I would anyway). How about cream with chalkboard paint above the keys? I like the glazed look, and I think the chalkboard above the keys would be adorable! Or you could get vinyl lettering that says “Practice Makes Perfect” and put it above the keys. I think I have to vote for turquoise! Or at least a bold color. Ooooh! Maybe a color that goes with one of your paintings from that guy whose name I can’t remember. THAT would look great over your piano (since you are planning on moving it from over the fireplace. And I definitely think the guitars need to go someplace else. Can’t wait to see what you have planned!! Hi, new in these parts… but just had to tell you that I think a nice rich taupe might be neat. Similar to choosing black or cream, but yet different. Good luck on your project! I like the black, rustic, or glazed looks! I usually love color, but as a piano lover I am finding myself going more classic. My vote is to either re-stain it or go black. (Of course the “Play Me I’m Yours” was awesome.) White or creamy pianos have always looked 70’s to me for some reason. 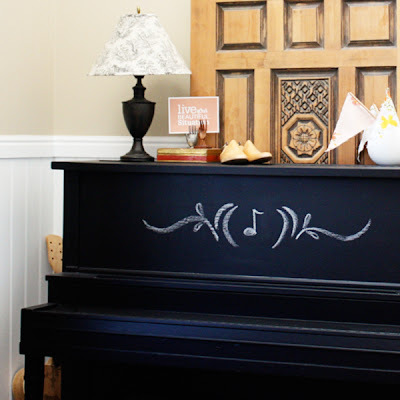 To be just a little daring maybe do the inset above the keys in chalkboard paint. Good luck. I’ll be interested to see what you do. Good luck & can’t wait to see the finished product! I like the bright blue but it wouldn’t work work in too many homes. The chalkboard one is cute! Won’t painting a piano change the quality and tone of the sound? The rustic look would look great in your room it seems. 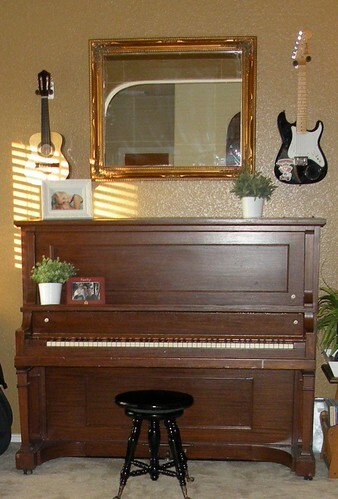 I love this idea I wish I had room for a piano. I love love the shabby chic look because thats what I do to wood pieces anyways. But the chalkboard paint ones is also a fav as well as the rustic. Can’t wait to see it all done. I saw one that was yellow, it was pretty cute. I also loved the red. I guess I think a piano should have a new life with a new color for pianos. Can’t wait to see what you choose I am sure it will be awesome.